Without question, the most beautiful modernist blender that was ever created. This blender is unique in that it has a relatively quiet motor, has a keypad (the designer kept the vision of a blackberry in mind), and a 2 liter pitcher that is glass. 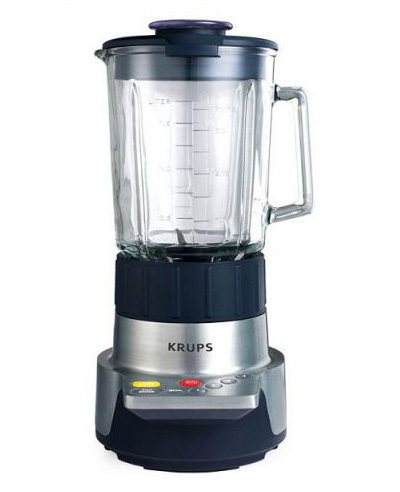 Integrated in the blender's discreet lines are elegant solutions which make it the best blender on the market. Manufactured from superior grade die-cast aluminum and glass. Krups stands professional-grade appliances. So they only use materials that are quite solid, namely aluminum or glass, and not plastic, to convey sturdiness, durability, value, and performance. • Keypad with five speeds. • Sturdy superior grade die-cast aluminum. • Extra large 60 oz. capacity glass jar. * Superior 1100 Watt motor. * Pulse and Ice Crushing. * All parts are dishwasher safe except motor. * Includes great recipe book.